Construction projects can be complicated and these days it’s a bit unusual to hear the terms such as “under budget” or “ahead of schedule” when mining companies describe the delivery of challenging international mining projects. Recently, Pan American Silver Corp. and J.S. 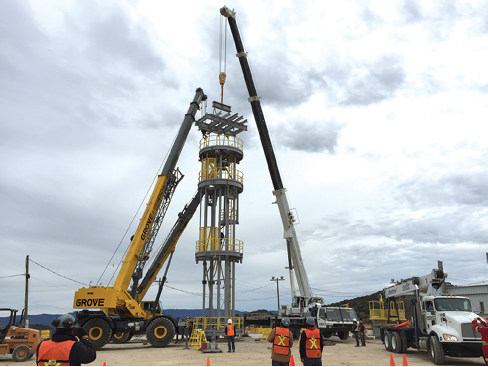 Redpath Ltd. teamed up to safely, timely and economically deliver a new production shaft and hoisting system at the La Colorada mine, near Zacatecas, Mexico. Pan American Silver acquired La Colorada in 1998. Located in the Chalchihuites District, the polymetallic underground operation uses cut-and-fill stoping to mine ore, which is processed at two plants (oxide and sulphide) to produce silver and gold doré, and silver-rich lead and zinc concentrates. 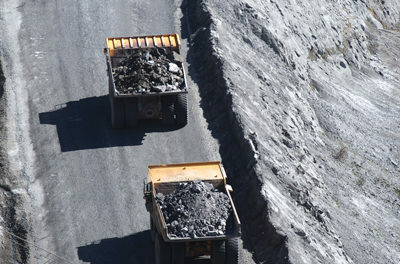 In December 2013, the company approved an expansion plan for the operation that included installing a new power line to the project, expanding the sulphide processing plant, constructing the new 618-meter (m) deep Cimarron shaft and the development work to access new production areas to ultimately grow production to 1,800 metric tons per day (mt/d). The capacity at La Colorada’s processing plants would progressively grow from 1,330 mt/d in 2015 to 1,500 mt/d starting in September when the new shaft was commissioned, and ultimately to 1,800 mt/d by the end of 2017 as the new development areas come online. 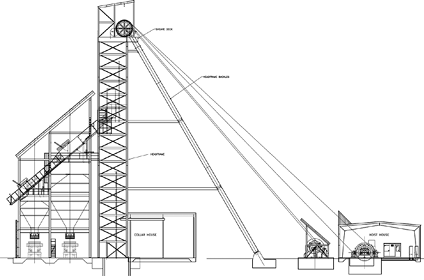 With tight timelines, Pan American Silver commissioned Redpath to design and engineer a new rock/ore handling system for the mine. 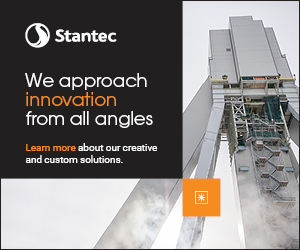 The scope of the project included the shaft and shaft steel designs, shaft bottom load out facilities, headframe, bins and truck load out on the surface, and the hoisting plant and associated buildings. The project had several constraints, including a very tight schedule to design, procure and construct the facility to align with the concurrent construction schedule for the new ore processing facilities. To mitigate risks presented by the condensed schedule, Redpath assembled a technical team that integrated key Pan American Silver individuals on an ongoing basis into the design efforts. This proved critical in fast-tracking designs by providing direction and timely decision-making throughout the program. Additional requirements were relayed from the mine site in Mexico to the design engineers at Redpath’s headquarters in North Bay, Ontario, who would incorporate them into the construction drawings and the equipment selection and procurement process. The project also benefited by integrating the future sinking requirements into the permanent production facilities. The designers were able to assimilate the requirements of the shaft sinker into all aspects of the plan, providing for a reduced program once the shaft sinking contract was awarded. Originally, Pan American Silver planned to raisebore the full rough diameter of near 5.5 m from the existing workings 618 m below to the surface and then concrete line and equip the final shaft for skipping and cage operations. Master Drilling Mexico SA de CV, was contracted to carry out the raiseboring component of the project as they were already on the site developing ventilation raises for the mine. Given challenging ground conditions in the upper 200 m of the shaft, it was decided to reduce the diameter through this upper section to 2.4 m.
Raiseboring a deep shaft such as this provides potential savings from traditional blind shaft-sinking methods, but it also comes with significant inherent risks. Shafts used for hoisting, especially those requiring shaft steel, demand very tight vertical tolerances over the entire length of the shaft. If there is not near perfect vertical alignment, the conveyances will not operate smoothly on the guidance system leading to accelerated wear caused by the misalignment. In a raisebored shaft, it is critical to ensure a true straight vertical hole to allow such an installation to be constructed within it. Centerlines for hoist rope positions cannot normally drift off vertical by more than an inch or so, and keeping a raisebore pilot within this tolerance requires special steering applications. Modern drill-steering systems can correct minor deviations in raisebore pilot hole drilling, and these systems are being applied to hoisting shaft construction more now. Both rotary vertical drilling systems (RVDS) and GyroData systems have been successfully applied to carry out this level of accuracy on similar type projects in recent years. The decision to undertake this method, however, has to be weighed against several constraints. The risk carried by any raisebore project depends on the confidence with which the rock mass conditions are known. Other risks that need to be assessed include the ground conditions within the hole both for the pilot hole accuracy, and its ability to stand unsupported for a period after boring is complete, hydrogeology, and the mine’s ability to handle the large influx of bored cuttings at the bottom of the hole. In early 2015, Pan American Silver selected Redpath to complete the Cimarron shaft project with the construction work to be executed by its Mexican subsidiary, Redpath Mexicana Construcciones, SA de CV, with management oversight by technical, controls and shaft specialists from North Bay. With the formal project award, Redpath and Pan American Silver began to identify further risks to the project through a multiday formal Process Hazard Analysis (PHA) program. A project execution team was formed and its members were pulled from the site management teams of both Pan American Silver and Redpath. Recognizing the tight construction deadlines, the small, cohesive team tracked and controlled decision making on a daily basis. Senior members of both contractor and owner made up an oversight management group that would meet periodically to resolve any issues of magnitude requiring more senior levels. This proved to be the most important part of the success of the project, with the site team having the ability and authorization to respond to changes within the programs, explained Kevin Melong, senior manager-shaft services for Redpath. Further risks in the project’s front end design and procurement phase were mitigated by evaluating and auditing local and regional suppliers to ensure they could conform to project standards. Using qualified regional suppliers proved to be an advantage as a large portion of procurement could be conducted in Mexico with an obvious cost savings. 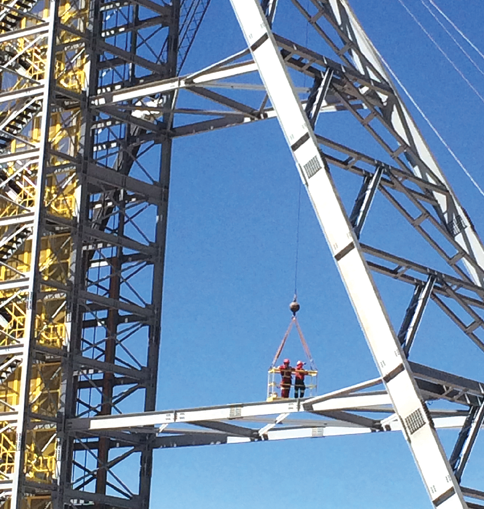 Equipment suppliers were able to work with fabricators to expedite the headframe and shaft steel, and also supply the level-loading and shaft-loadout systems. Redpath site engineers routinely inspected Mexican shops to ensure compliance with quality assurance and quality control specifications and frequently conveyed last-minute design changes to the suppliers. Melong credited Doug Sands and Pedro Gonzalez, Redpath and Pan American Silver project managers, respectively, for their unrelenting focus to execute this project without injury. “The entire surface construction was completed without incident and is a proud achievement of the entire multinational workforce,” he said. 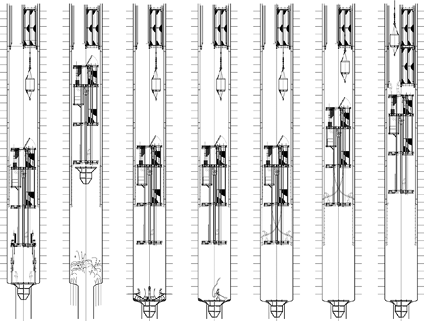 The shaft-sinking methodology evolved to align with the actual conditions encountered during the drilling of the pilot hole. Prior geotechnical drilling in the vicinity of the shaft revealed geology in the upper section of the shaft near the surface that was considered substandard from a bore-ability perspective. Concern centered on the instability of the sidewall and reaming face when a full 5.1-m diameter hole was reamed. To mitigate this risk, the upper 200 m of the shaft was reamed at 2.4-m diameter while the lower section was reamed to a full rough unlined diameter. In addition, following the boring of the top 200 m, this section of the shaft was remotely shotcreted by Shotcrete Technologies, Inc. to prevent deterioration and sloughing of the walls. This also meant the shaft-sinking stage and methodology had to be tweaked slightly to allow for slashing of the shaft walls in the upper 2.4-m diameter section. Two pneumatic jumbos were added to the sinking stage to handle the excavation or widening of the hole to full size in the upper section of the shaft. It also presented a significant risk mitigation strategy for the remainder of the hole should the vertical accuracy of the pilot hole prove insufficient for shaft hoisting. A four-deck sinking stage provided a work platform for workers to drill and blast, and install the concrete liner, shaft steel and services. The stage was suspended from three hydraulic winches positioned in front of the hoisting building on the surface with ropes passing over sheaves mounted on the permanent sheave deck. 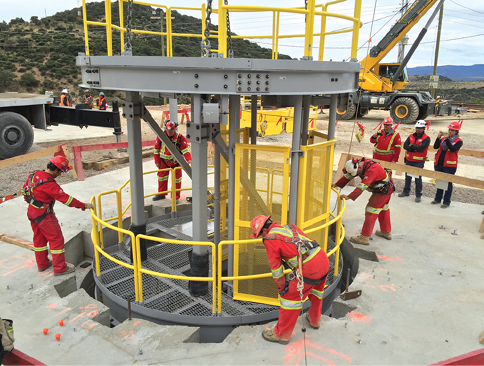 The new 10-ft double-drum production hoist from Hepburn Engineering Inc. was fitted with modified closed door transport riding buckets for miners in lieu of traditional sinking buckets, as there was no rock hoisting required. Workers and materials were transported to and from the advancing work area in closed cage-like buckets. crete forms with curb ring were used. Concrete inserts were cast into the pours to connect the final shaft furnishings to the concrete liner at 6-m intervals. The production cycles in the upper segment of the 2.4-m shaft consisted of setting a hole plug, lowering the shaft jumbos and drilling off the bench, loading and blasting. This was followed by bolting and then lowering the shaft forms to pour the concrete liner. Once the concrete pour was complete, the stage was raised and the permanent shaft steel, service brackets, power, pipe and other services were installed. The surface facilities (top) were constructed concurrently with shaft-sinking operations (bottom). When the workers reached the full diameter shaft borehole section, the production cycle consisted of only one segment of shaft wall requiring excavation due to slight misalignment of the hole. The shaft progressed rapidly through the final 418 m of length of shaft and therefore required the use of extremely high-strength, early-set concrete mix. The curb ring and shaft forms were broken and moved down multiple times in a 24-hour period—something very rare in traditional shaft-sinking operations. The forms are supported by the high-strength hanging rods embedded in the last pour. The crews pour concrete, muck the shaft bottom, drill-and-blast, bolt the walls, muck again and the break the form. For these traditional near 24-hour length cycles a standard 20-mpa concrete mix works well. Melong also noted that the surface bins and the permanent dump were constructed concurrently with shaft-sinking activities, a testament to the focused planning and risk mitigation of the teams. 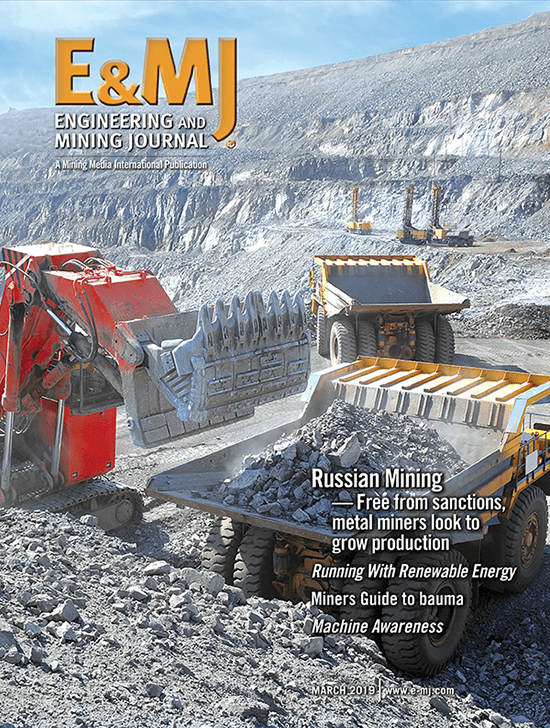 “We were using the headframe for shaft-sinking operations,” Melong said. “Concurrently, immediately adjacent to the shaft collar, construction crews were building the bins and the truck loadout. We were sinking a shaft directly below the structure in which they were working.” Safety nets and no-go zones were established along with work area approvals and a number of other procedures to mitigate this risk. In all aspects of the shaft-sinking operation, the crews outperformed productivity estimates, Melong explained, while maintaining a near perfect safety record with no lost-time accidents and only two minor medical aid incidents occurring. Surface works commenced in August 2015 with sinking plant commissioning activities completed in February of this year; only seven short months from mobilization. The upper section of the shaft was completed by April, and the remainder of the shaft to 618 m was lined and fitted out by mid-July of this year. Load out facilities on the 588 level were completed and skips installed into the shaft in August. Final commissioning of the plant at design hoisting capacities was completed this September, followed by final site demobilization in October, after only some 14 months of total construction time. On September 8, Pan American Silver reported that the new 618-m deep Cimarron shaft had been commissioned in fully automatic mode, ahead of schedule. The work remaining to complete the La Colorada expansion project includes a new power line to the site and some additional underground development. The entire $137 million expansion project, exclusive of sustaining capital, is now expected to be completed under budget. When La Colorada achieves its new nameplate capacity of 1,800 mt/d, annual silver production is expected to grow 69% to approximately 7.7 million oz.